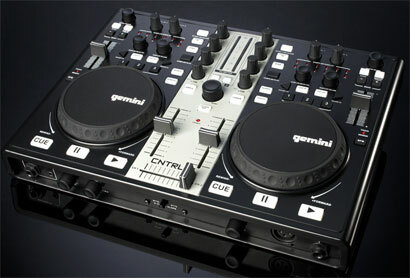 Gemini DJ is now shipping the CNTRL-2 and CNTRL-7 USB DJ consoles. Building on the success of their original digital controllers, Gemini’s new CNTRL-2 and CNTRL-7 take functionality to the next level by incorporating fully mappable MIDI. The addition of MIDI ensures that the new CNTRL series is compatible with most popular DJ software. An impressive range of intuitive features also makes them ideal for DJs just getting started in the digital realm, or even seasoned pros looking for a powerful, lightweight mobile solution. Both the CNTRL-2 and CNTRL-7 feature two decks, each with a touch-sensitive jog wheel that allows users to search, cue and scratch. The consoles also boast loop and sampler sections, along with 3-band EQ, creative effects, a cross fader with adjustable slope and pitch control sliders. Plus, the CNTRL-7 includes a new redesigned soundcard with comprehensive input and output connections. Thanks to professional features at a truly accessible price, Gemini’s new CNTRL series offers two dynamic, easy-to-use, tools for anyone looking to get involved in the digital DJ revolution.